Located on its own private island just off Taveuni Island, Matangi Island Resort boasts a tropical rainforest, white sandy beaches, volcanic rock faces rising from crystal clear waters and fringing corals reefs where a great diversity of marine life abounds. This privately owned 240 acre unique horseshoe shaped island paradise is restricted to adults only, making it a haven for a Fiji honeymoon or unforgettable Fiji wedding. 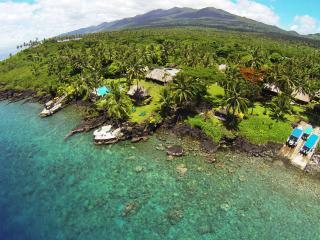 Paradise Taveuni is a unique boutique resort perfectly set within 5 acres of lush oceanfront, tropical gardens. 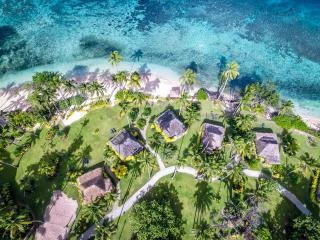 This Fijian resort is ideal for couples, single travellers or families wanting a secluded and tranquil holiday experience. Paradise Taveuni is also a divers dream with the resort only minutes from pristine reefs and diving directly from the shore, marina or dive boat. Qamea Resort & Spa is a luxury adults only resort on the Island of Taveuni and approximately a 90 minute flight from Nadi Airport. Qamea Resort & Spa has seventeen luxuriously appointed Beachfront Bures and stunning villas with private pools, nestled among swaying coconut palms and tropical gardens. Most accommodation is beachfront and has a romantic feel with outdoor river stone showers and four poster canopy beds in each bure pefect for a romantic getaway. Located on a cliff top with a picturesque outlook to the Somo Somo Strait. 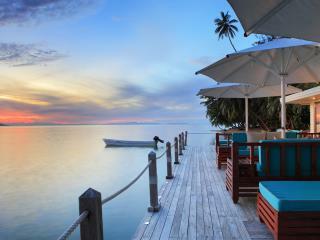 Taveuni Island Resort & Spa offers romantic luxurious honeymoon accommodation for just a maximum of 28 guests. The resort is intimate, offering guests privacy and seclusion with accommodation in modern bures. 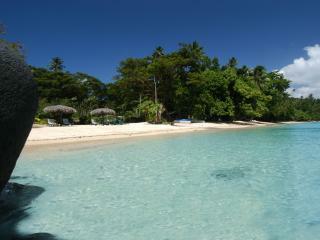 Taveuni is also a haven for scuba divers and snorkellers. Tariff includes all meals and non-alcoholic beverages.